It is time to enjoy bathing! Baby Hazel basks in the sun at the beach with her pet Katy, they both are having fun! After that, it is time to head home and try out various relaxing spa baths in the bathroom. Help Baby Hazel in having fun at the beach, and having a bath and shower at home, while trying out four different relaying spa baths, for which she has to collect the ingredients! Can you make Baby Hazel happy and comfortable? Ah, the sunlit beach…Baby Hazel and her pet rabbit, Katy are having fun on the beach. Give the needed items to Baby Hazel and her pet as they request them, and make sure they don’t go into the water without the safety gear! After Katy, the pet rabbit does some bad things, Hazel decides it is time to go home. Ooh, Baby Hazel and Katy are so dirty, it hurts just looking at them! 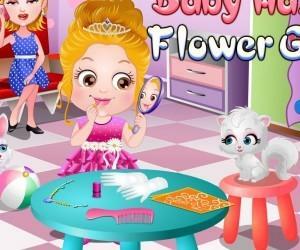 In this level you have to help Baby Hazel get cleaned up. She needs to have a shower, clean herself up with shampoo, dry herself with a towel, and put on some clothes in the end. Just give her the items that she requests. 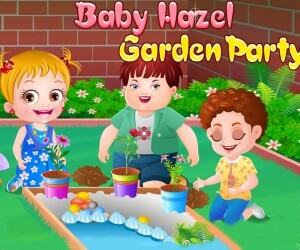 Baby Hazel decides to have some fun by enjoying a relaxing spa in the bathroom, but she needs the ingredients! Help her in the kitchen to collect these. But first, you have to select your favorite bath mix from Milk Mix, Chocolate Mix and Cherry Mix. Each of these three has different ingredients and different experiences while bathing, so make sure to replay the game two times to enjoy all of them! After picking a mix, you need to alternate between selecting items around Hazel, and clicking the ingredients on the bottom part of the screen in the order Hazel’s bubbles pop up above her head. After this you follow her into the bath, where you play the same thing you did before, but now you help her in enjoying the bath mix you had chosen. ive her various items as she needs them, and help her in having a good time; and finally at the end, you have to help her in drying herself and dressing up. This game can help your children in understanding the importance of having regular bath, cleaning up and showering him/herself. Also it can impart some basic knowledge about safety at beaches. Baby Hazel enjoys a unique spa bath! Why don’t you join her?